Frank E. Dittenhafer can thank one of the founding fathers for cultivating his early interest in Architecture while he was still in elementary school. It was on a family visit to Monticello, the 33-room Virginia home that Thomas Jefferson designed for himself, that a seed of interest was planted in the student. It would take root during high school and blossom into a passion, leading to an award-winning career in project design as the leader of Murphy & Dittenhafer Architects. Other than art classes throughout the years and one high school mechanical drawing class, “it really goes back to that,” Dittenhafer says. Growing up on the edge of a small town in rural Dover, York County, Dittenhafer was surrounded by farms and cornfields. “That sense of the landscape was very influential in how I thought about architecture eventually, this appreciation and sensitivity to the land,” he explains. With so much open space and farmlands in this natural setting, he started thinking about how structures “appeared and arrived” to create new places. He compared rural development with what he saw while growing up when his family ventured into the cities of York and Baltimore. Dittenhafer enjoyed designing and making things. Whether it was inventing games, blazing a trail or designing a small golf course layout for friends around the elementary school building across the street from his house. He was always creating something and sketching the designs on paper. Throughout his school years, Dittenhafer’s broad creative interests encompassed art – both visual and the performing arts. He was involved in music, band, chorus and the class play. Academically, he enjoyed math for the challenge of finding the answer. “I was pretty good at science and math but couldn’t see myself doing that as a living. I was always wondering, ‘What combines the arts, math, and sciences?’ I always had a mindset growing up that Architecture could be an interesting path,” he says. Dittenhafer also enjoyed being around people, and he realized that Architecture not only embraced analytics, creativity and visual art, but would allow him to help people achieve their vision. As a senior at Dover Area Senior High School, Dittenhafer’s college visits focused on Penn State University – but also included Carnegie Mellon University in Pittsburgh and University of Maryland in College Park. He was leaning toward studying Architecture, but in the era before information became instantly available through computers, he didn’t know much about the profession. He had never met an Architect. He enrolled at Penn State in 1974, and despite being salutatorian of his high school class, he believed that his fellow architecture freshmen likely had taken more advanced courses than he had (at Dover) and probably knew more and were better prepared for this major. He plunged into an intense course of study. For three hours, five days a week, Architectural Design Studio immersed students in a challenge to their creativity. Beyond the 15 hours of mandated studio time, Dittenhafer and others became accustomed to working long hours and “all-nighters” for Design Studio projects. Dittenhafer says he thrived on that approach – and possessed the work ethic and drive to succeed. One of the assignments he remembers was to design a temple for a child. “It required a lot of research on what is play … and what is a temple?” he explains. The project was one example of learning how to approach a design problem and how to think - in what he calls “a fantastically inspiring environment” at Penn State. He graduated from Penn State with honors – and a bachelor’s degree in Architecture in 1978 with around 30 of the 45 students who had started out in the major as freshmen. Graduate school beckoned to some of them. Dittenhafer opted to work for two years (saving money for tuition and rent) before enrolling in a master’s degree program in architecture at the University of Pennsylvania in Philadelphia. Penn State, he says, provided excellent preparation for his advanced studies. Dittenhafer realized that with his Penn State Architecture degree in hand, he was gazing into the unknown. The economy was in recession, and jobs were few. He recalls a classmate driving to Iowa just for an interview. He scoured phone books for listings of architectural firms and pulled together a resume and a portfolio of his college work at Penn State. He sent out probing letters and knocked on doors, showing up on architectural office doorsteps in York, Harrisburg and Philadelphia. “I probably went to at least 30 firms or more in this vicinity,” he recalls. His break came when a friend’s father, who was an executive at Caterpillar Inc., in York, Pa., connected him with the president of Noonan Engineering, a York firm with a small architectural component. The executive offered Dittenhafer a job and asked him what salary he thought he should receive. Dittenhafer never forgot that conversation and the degree of integrity, respect and fairness it represented – as he found himself in the “president” role years later – interviewing recent architecture graduates for employment at Murphy & Dittenhafer. The Noonan firm employed other Penn State graduates, providing a point of connection for Dittenhafer. He continued to work there during graduate school summers and holiday breaks. Dittenhafer was driven by his passion to produce top-notch Architecture. “I still had all this creativity inside me as I was learning the nuts and bolts of the profession,” he says. He recalls working on the design for the renovation of one entire floor of a Building on the York Hospital campus to create a new Family Practice Center. Although much of the material pallete was concrete block, hollow metal frames, wood doors, vinyl floor tile and suspended acoustic ceilings – he learned the basics of commercial construction methods – and the design possibilities of using ordinary inexpensive systems. “I learned a lot at Penn State, and it was reinforced at Penn,” he says. Penn granted him a year of advanced standing because of his PSU courses – and Dittenhafer obtained his Master of Architecture degree in just two years from the Ivy League institution – receiving a traveling fellowship along the way and the Bronze Medal for Design at graduation. “I still had hope that I would get the opportunity after graduating from Penn to do some really interesting design work and great architecture – wherever I went. I had a lot of pent-up energy and hope and inspiration. I didn’t know where it was headed,” he says. Large architectural firms were recruiting at Penn when Dittenhafer received his graduate degree. He had offers from companies in Atlanta and Washington, D.C., but he had his eye on RTKL, a 300-person Baltimore firm, and he accepted a position there. In his first year, he joined several other RTKL architects on a project in northern Baltimore to transform several historic buildings and design new ones for a large insurance company – on a campus that had previously served a religious community. One of the architects sitting two cubicles away from Dittenhafer was Michael Murphy, also a University of Pennsylvania Architecture graduate – five years earlier. The two worked together on one of the new buildings and became friends, attending lectures and American Institute of Architects events in Baltimore and Washington D.C. They had similar philosophies when it came to architectural design. They both were heavily influenced in their thinking by legendary Philadelphia Architect and Penn professor Louis I Kahn – and other contemporary practitioner/theorists including Robert Venturi. Murphy moved on from RTKL to a small four-person architectural firm in Baltimore, and Dittenhafer soon followed him. There, he got the chance to work on detailed aspects of meaningful smaller scaled projects. When the small firm merged with a twenty-person Baltimore firm around 1984, Mike Murphy left to launch his own firm in the city. Dittenhafer took and passed the architectural licensing exam on his first try in 1984 – and pondered his future, wondering whether to stay where he was or look for another company turning out interesting work. He and Murphy still got together, and one day at lunch Murphy offered his former colleague an equal partnership at his firm. Just after Christmas 1985, “Murphy & Dittenhafer Architects” was formed and officially registered as a corporation. Its first two projects, Dittenhafer says, reflect the spectrum of work that he still embraces. One was a prestigious, $2 million project in which the firm would design an addition to the revered Georgian revival campus building to include a suite of new dining/meeting rooms at the Johns Hopkins University faculty club on the Homewood campus. The new spaces would feature elegantly detailed millwork, indirect lighting, high ceilings and articulated brickwork. The other project involved renovating three empty barrack structures at the Army’s Fort Meade base into a homeless shelter for a Catholic social services agency, a relatively modest venture but one with life-changing impact. Dittenhafer worked on every design aspect and did all of the drawings for the shelter project and says it was typical of the “community based” work the new firm undertook and that his company still performs today. Another early design by Frank Dittenhafer that reflected that “Search for Beginnings” thinking was the York Housing Authority’s Fielding Way public housing development in Yocumtown, York County. “I asked, ‘Why does public housing have to look the way it looks? Why can’t it look like a little village?’” Dittenhafer says. He was thinking of the small towns in York County he knew so well in his youth. Murphy & Dittenhafer doesn’t strive to win awards for its designs. But 210 of its projects have been recognized for architectural excellence, historic preservation, and craftsmanship. The firm has received 108 AIA (American Institute of Architects) Design Awards – including three in 2018 – marking the 23rd consecutive year of the firm’s recognition for excellence in architectural design. The firm was an early practitioner of Adaptive-Reuse and designing renovations to repurpose existing older and many times historic buildings for new uses. For the Byrnes Health Education Center in York, Susan Byrnes, with a background as an emergency room nurse, wanted to establish a facility where people of all ages could learn about healthy lifestyles. In 1996, Murphy & Dittenhafer came up with a design to transform a former Dodge dealership structure into an exciting venue for education. Instead of just carving up the large space into rectangular classrooms, the architects created a visual celebration of the landmark building, leaving the steel beams and concrete columns of the service bays exposed in “teaching theaters” – and adding natural daylighting to produce an engaging and inspiring space for children and adults to learn. Among the many other sites where the firm has employed adaptive reuse are the Lofts on George Street, York’s first conversion of an existing structure for urban housing; the Seminary Ridge Museum in Gettysburg utilizing historic Schmucker Hall where General Buford saw the Confederate Army approaching the town from the building cupola; and Lanham Hall at Maryland’s Prince Georges Community College, an imposing fortress like structure built in the early 1970’s that Dittenhafer says had been the most hated building on campus - but is now where students gather to pose for selfies. “Our extensive involvement with designing these creative new uses for existing buildings are a big part of who we are at Murphy & Dittenhafer Architects – and how the profession has evolved,” Dittenhafer says of adaptive reuse. That’s not saying that Dittenhafer’s firm portfolio excludes new buildings – quite the opposite. Some of M&D’s most celebrated designs include projects such as the New Municipal Building for West Manchester Township in York County, the Pullo Family Performing Art Center/Glatfelter Library at Penn State York, East Side Yards campus for the City of Baltimore, the new Student Services Building at Community College of Baltimore County in Essex, Maryland, Boonsboro Library in Washington County, Maryland and the University of Baltimore Student Center – among many others. Beyond just addressing functional needs, Dittenhafer says, designs must be pleasing to those who will occupy the space, and natural daylight always plays a major role in achieving that goal – regardless of project type. One corner of the new student center Frank designed at the University of Baltimore boasts five levels of glass walls that offer great views and allow daylight to pour into lounges designed for students. CODO 241’s new lofts and apartments in York feature interior spaces flooded by natural light in a historic building and complimentary modern addition. An underused exterior courtyard at the Washington County Museum of Fine Arts is now topped with a skylight, creating a year-round assembly space that has become the heart of the facility. The lawyers at a firm in the historic Payne-Shoemaker Building in Harrisburg might have enjoyed their offices on the perimeter of the art-deco structure. But Murphy & Dittenhafer had a different idea for the 12th-floor space it was redesigning for the Pennsylvania State component of the American Institute of Architects. An efficient plan that eliminates corridors for more communal and meeting rooms did away with those offices and opened up the floorplate to striking views of the state Capitol complex across the street through new interior walls of glass. When designing new buildings, the firm strives to make the structures respond to their locations, Dittenhafer says. The West Manchester Township municipal building in York County, the Unitarian Church in York, and the Boonsboro Community Library in Maryland are examples of new buildings that the architects have nestled into their surroundings – and which allude to the familiar forms of agricultural, industrial or communal structures – without being literal. “We don’t try to fight the landscape. The land is more important than any building,” Dittenhafer says. Dittenhafer isn’t a fan of mission statements. But from its inception, his firm has sought to always meet three standards: Do excellent Architecture, be fairly compensated for the work, and enjoy what his team of architects, interior designers, administrative support staff, and business-development personnel do. Those standards started with Michael Murphy and Frank Dittenhafer combining their talents in Baltimore in the mid-1980s. After setting up shop in just two rooms within the Cokesbury Building at 516 North Charles Street in the Mt. Vernon neighborhood of Baltimore, the business expanded until it had to move to larger quarters. It operated at the second location for 20 years, until 2010, which proved to be a fateful year for the firm. A five-alarm building Fire destroyed the firm’s fifth floor/rooftoop office in 2010, the economy was emerging from a recession, and Mike Murphy, whom Dittenhafer calls “the best business partner you could ever want,” died unexpectedly. Murphy had been the more public face of the firm, says Dittenhafer, who concentrated on the firm’s architectural designs. Fortunately for the firm, with its Baltimore location temporarily lost, it had opened an office in York, Pennsylvania, in the early 1990s. Sue Ann Kline, Dittenhafer’s wife, had extra space at her Kline Graphic Design studio, and the firm had expanded into that location. In 1997, the architects started looking for a permanent space in downtown York, and the firm moved into the former Hotel Codorus on West Market Street in 1999 after two years of extensive renovations – transforming a derelict four-story building on the west bank of the Codorus Creek that had housed an Adult Boookstore. The successful launching of a York office had a lot to do with Dittenhafer’s York County roots, extensive community involvement and architectural design reputation . The move returned him to the place where he first imagined designing new structures for rural venues and transforming buildings in urban areas into inviting places with new uses. His connections in the area helped him win design commissions for homes, offices, banks, hospital/health care renovations, low-income and senior housing and renovations/additions and new structures at several college and university campuses. Murphy & Dittenhafer’s design work was fresh, creative, engaging – and many times incorporated ordinary “off the shelf” materials. Frank’s Pennsylvania Dutch “resourcefulness” – the ability to maximize the project design potential using modest means became a firm trademark - He built lasting relationships with organizations and institutions. Frank Dittenhafer’s relationship with Penn State University also extends deep into the York Campus via multiple design commissions including the Pullo Center/Glatfelter Library, The Lair (student lounge), Ruhl Community Room, Swenson Engineering Center, Nittany Success Center and most recently – the Graham Center for Innovation and Collaboration (a new 8,000 square foot building to be constructed immediately east of the Pullo/Glatfelter building). Dittenhafer also has been an active volunteer for many campus initiatives as well as a member of the Penn State York Advisory Board. In 2013, he was their speaker at Spring Commencement. A few years ago, Dittenhafer thought he might be able to raise the visibility of Penn State’s Department of Architecture and increase the involvement of fellow architecture alumni. He wanted to learn how alumni were giving back to the university and find ways for them to be more engaged with students. He submitted a personal profile, was nominated, and then was elected to the board of the College of Arts and Architecture’s alumni subgroup for Architecture. He later served as president of that board and now is its representative to the College of Arts and Architecture’s Alumni Society board. Dittenhafer also is a former president of Historic York Inc. and has served on the boards of the Pennsylvania Historical and Museum Commission and Capitol Preservation Commission. He has led the Central Pennsylvania chapter of the AIA, served on the State AIA Board – and was one of the founders of the Central Pennsylvania Architects Foundation – which conveys scholarships each year to deserving local recipients enrolled in Architecture degree programs. He was appointed to the Public Art Commission by the Mayor of Baltimore and serves on the Charles Street Development Corporation Board, Morgan State University Architectural Advisory Group and Garrrett-Jacobs Mansion Board. His community involvement with non-profit organizations including literacy councils, physically/mentally challenged populations, YMCA and many others is too numerous to list. Many of the projects undertaken by Dittenhafer and his team affect the lives of everyday people, sometimes whole communities, and reflect their evolving needs. Even libraries, which the firm has designed for a number of Central Pennsylvania/Maryland towns and cities, aren’t just repositories for books anymore, he notes. “They are community crossroads, gathering places. It’s about understanding people and what assistance and services are really important to them that improves the quality of life. I think we’ve done that,” he says. Some confirmation of this commitment occurred in 2007 when Frank Dittenhafer was inducted into the AIA College of Fellows at a ceremony held at The Alamo in San Antonio, Texas. Dittenhafer was selected as one of only a hundred or so Architects from across the United States for this honor. Rather than set goals for himself and his firm, Dittenhafer measures success against the standards that he has embraced since the first days of Murphy & Dittenhafer Architects. Dittenhafer credits his studies at Penn State for teaching him critical thinking, which marks his unique approach to the design of every project. He also credits his many collaborators at Murphy & Dittenhafer over the years since PSU – noting major contributions by long-term Murphy & Dittenhafer staff including Todd Grove, Bruce Johnson, Lauren Myatt and Beth Reed among many other talented and hard-working “great people”. 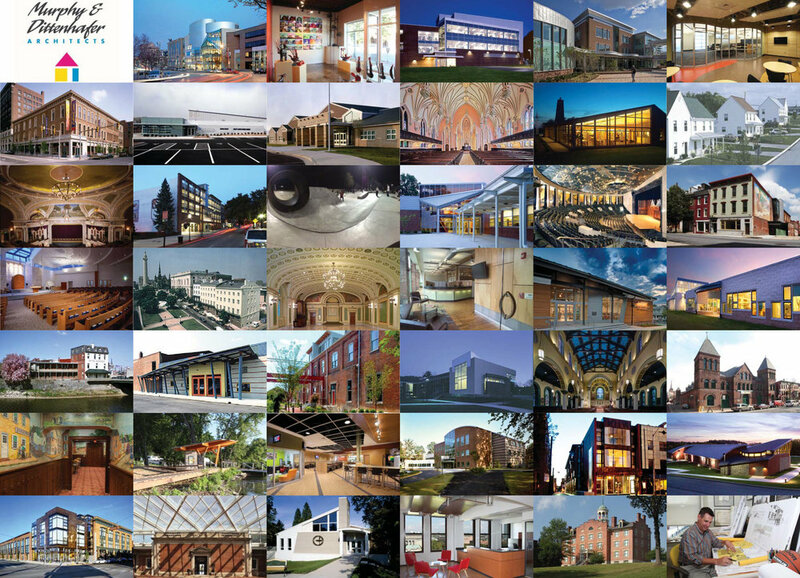 Dittenhafer noted that his firm’s current group of active projects includes some of the most interesting and diverse commissions the firm has ever been involved with – ranging from the $90 million/400,000-square-foot Forum Building in Harrisburg, Pa., to the Harriett Tubman Cultural Center in Howard County, Maryland, to the pro-bono design for a Veterans Memorial at Dover High School – his high school alma mater. Since graduating from Penn State four decades ago, Dittenhafer believes his role in Architecture has adapted over time while becoming more refined. “What’s important is to continue to listen, really look closely at what is happening in the environment, be open-minded, be open to change, evolving without abandoning our fundamental principles,” he says. Ultimately, he finds success beyond what the finished projects look like.